Easy weeknight meals are a must for me. Are they for you? I find that when I don’t meal plan, or something gets in the way of what I’ve planned I need a quick and easy meal that I can pull together in no time flat, and get on the table in a matter of minutes. Let’s face it. There are days I am all sorts of prepared and ready to go (those are usually slow cooker days – check out my pot roast recipe) and then there are those days that I just don’t want to cook. I’d rather pile my family into the car and head out to my favorite restaurant. When I found myself leaving the house at dinner time more often then I knew I should, I knew it was time to amp up my easy weeknight meal arsenal. I started to develop some of my own, and when short on time I’d reference some from Food Network – a go-to for me. Their collection of easy meals is extensive. The inspiration for my Skillet Chicken Cordon Bleu came from the ingredients I had in my fridge. It happened on a day I wasn’t feeling like taking on a big dinner project. For protein, I had chicken and lunchmeat available and non-frozen. Since I had ham and cheese, cordon bleu came to mind. I did not, however; have any intention of rolling up meat and putting anything in the oven. It was hot. 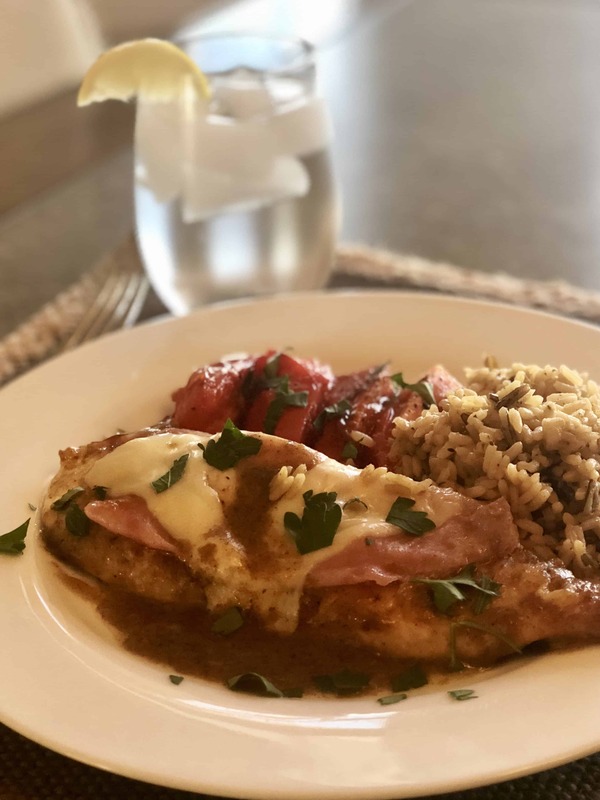 I wanted an easy weeknight meal, and I was determined to find a lazy way to make chicken cordon bleu easy. Turns out it was a complete hit – one that my boys have asked for again and again. Not only that – I think this is a recipe that can be used for entertaining as well. It looks pretty, it’s delicious, and best of all, it’s on the table in minutes! Skillet Chicken Cordon Bleu is a quick, easy meal that you can get onto the table in a matter of minutes! Step 1 Preheat oven to 350. Step 2 Pound chicken until thin. Step 4 Sprinkle garlic powder on each. Step 5 Coat each of the chicken breasts in flour. Step 6 Cook the chicken breasts in melted oil and butter until browned and cooked through. Step 7 Remove chicken from the pan and whisk in mustard and lemon juice. Step 8 Add corn starch to your chicken stock and whisk together. Step 9 Add mixture to the mustard and lemon juice in pan whisking at all times. (Make sure to get those lovely brown pieces off of the bottom of the pan). Step 10 Add chicken back to the pan. Step 11 Top with one slice of ham or prosciutto. Step 12 Finish with one slice of cheese. Step 13 Place in preheated over for 5 minutes allowing the cheese and prosciutto to heat and the cheese to brown. Step 14 Serve with roasted tomatoes and garnish with parsley (if you have it on hand).